Leaptop's new, larger screen makes the pretend computer play even bigger, featuring 26 fun animal animations! Tap away in 4 learning modes, including ABCs, Messages, Games, and Music. Earn 85 AgapeDollars for purchasing this product. Leaptop's new, larger screen makes the pretend computer play even bigger, featuring 26 fun animal animations! Tap away in 4 learning modes, including ABCs, Messages, Games, and Music. In ABC mode children can hear the letter, the letter sound, and a word using that letter. In Message mode children can pretend to send and receives emails with Scout. In Games mode, play fun animal trivia and letter games to reinforce the learning. In Music mode, choose from 16 fun songs and melodies. Pretend, play and learn away! Learn about the alphabet, spell your name and more on a pretend play computer built for kids. The award-winning play of My Own Leaptop is now even better with a larger screen featuring 26 fun critter animations! Tap away in 4 learning modes—ABCs, Messages, Games and Music—and bop along to 16 songs and melodies. Be big - and little. Pretend to be like Mom and Dad with fun computer role-play, such as emailing with Scout or Violet, and a take-along handle. Customize My Own Leaptop to help your child spell his or her name. Skills learned include the alphabet, pretend play, music & rhythm, media literacy, and animals. Alphabet and early vocabulary learning is reinforced with every tap of a letter as children play on a laptop made just for them. Fun animations bring the learning to life, and children are able to pretend to exchange emails with Scout and Violet. Learn the alphabet, spell your name and more! 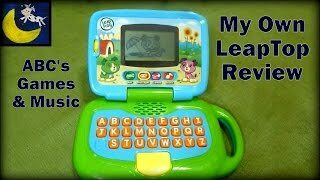 Customize My Own Leaptop to spell your child's name.